USB car charger with PD charging USB type C and USB type A. 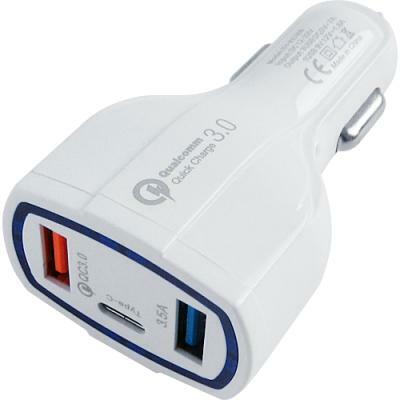 This Charger allows for three of your devices to be simultaneously charged while using your cars valuable 12v DC power socket. Quick Charge 3.0 Qualcomm Certified. Premium quality material with high gloss exterior and user friendly LED charging indicator. Smart IC chip safeguards against over-current, overcharging and overheating. USB Car Charger with PD Charging USB Type C and USB Type A.